We’re going to start highlighting some of the various comic book projects currently seeking funding through Kickstarter. 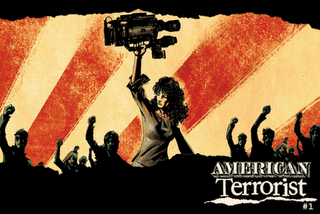 Today’s spotlight is American Terrorist: The Graphic Novel (seemed like a good one to start with considering this blog’s subject matter). Described as a story of “passion, activism, and political dissent” and is produced by the husband and wife team of Tyler and Wendy Chin-Tanner, art by Andy MacDonald, colors by Matt Wilson and published by A Wave Blue World. You can actually read a preview and early chapters of the graphic novel before contributing. The first full chapter is available at http://www.awaveblueworld.com/v03/AT01.pdf. With your pledge you receive all kinds of different gifts from a behind the scenes making of blog to being a named character in the comic. As of 11pm on June 15 they have raised $1,672 of their $6,000 goal from 24 backers. Your ability to pledge ends on Sunday June 27 at 6:15 EDT. Get your pledge in today!